We are entering a season for celebrations, and the symbol of light plays a part in many of our spiritual traditions. Light in the darkness can be a powerful metaphor for important ideas: courage in spite of fear, empathy in place of judgment, love instead of animosity, faith in place of doubt, and hope in the face of despair. The experience of trauma can cast a dark shadow over our lives. But I believe the light of healing can turn tragedy into an opportunity for change and growth. Often, we can’t find the light we need on our own. Finding the courage to take the first step – asking for help – can start us on the path to transformation. Those in our community who attended the first Resilience Café last month were able to take some steps toward healing. People filled Aqus Café to capacity the evening of November 11th to learn about emotional trauma, take part in small group discussions, and fight the stigma and isolation so often imposed on sufferers of our hidden epidemic. It was truly an opportunity for all to “Listen, Share, Heal.” Please join us for our next Resilience Cafés scheduled for Monday, December 9th and Monday, January 13th, at 7:00 PM. Soon, 2013 will draw to a close. For many of us – including me – this has been another challenging year of struggle and change. As painful as many of these challenges have been, I am grateful for the opportunities they have offered me. I look forward to 2014 with excitement, trusting that great things can happen when I act with courage and strength. Take hold of this thought and put it into practice in your life. Amazing things can happen. Petaluma’s Aqus Café was filled to capacity November 11th for the first meeting of Resilience Café, a public forum for the discussion and healing of trauma. Community members of all kinds – veterans, treatment professionals, ordinary individuals – came to learn about trauma and how it might be impacting their lives. 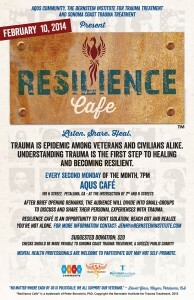 Billed as an opportunity to “Listen, Share, Heal”, Resilience Café was created jointly by the Bernstein Institute and Aqus Community. Together, we want to fight the stigma often associated with mental health challenges and the isolation trauma sufferers experience from this “hidden epidemic”. Aqus Community founder John Crowley opened the evening with a welcome for the packed crowd and an explanation of our goals for the event. In my remarks, I offered a definition for trauma and then briefly outlined the several types of trauma and their symptoms and effects, in simple terms for everyone to understand. 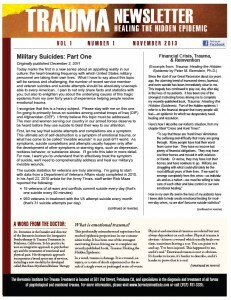 Wes Easley, a military and law enforcement veteran and staff member at the Bernstein Institute, shared a personal account of his self-isolating tendencies following a sudden career-ending injury in the line of duty. Small group discussions followed, with an opportunity for all to open up, if they wished, to be heard and to receive support. The evening ended with summaries of each group discussion and my parting message. Steve Rustad, board chairman for Sonoma Coast Trauma Treatment, filmed portions of the evening and his recording is available on UTube, by following this link. 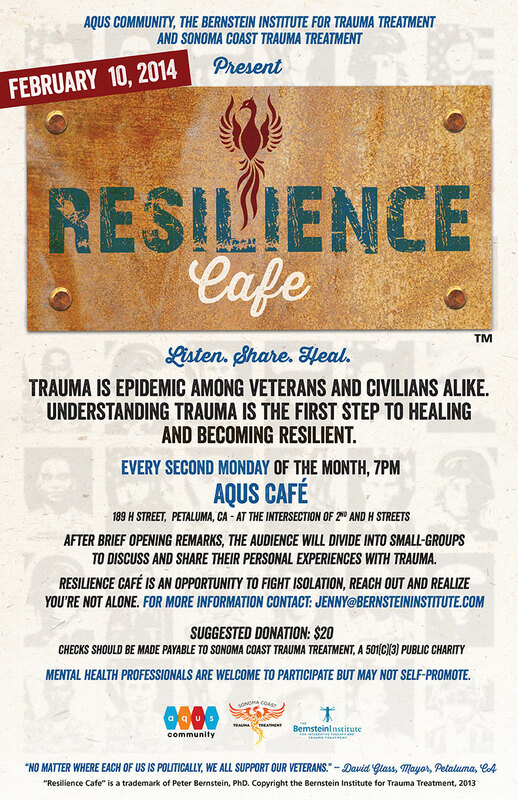 We plan to make Resilience Café a monthly event at the Aqus Café, 189 H Street, Petaluma. We encourage everyone to join us at our next meeting, December 9th from 7:00 – 9:00 PM. Meet Me at the Sebastopol Copperfield’s on Saturday, November 2nd! On Saturday, November 2nd, from 12:00 to 2:00 PM I will be signing copies of my new book, Trauma: Healing the Hidden Epidemic, at Copperfield’s Books, 138 N Main Street in Sebastopol. Please drop by. I would love to meet you and personally autograph your copy. 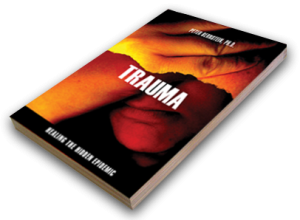 As I’ve mentioned in recent posts, I’ve written my book to describe trauma—its nature, symptoms, and effects—in terms everyone can understand. I’ve included very practical actions you can take to begin to heal the often minimized or dismissed burdens of trauma, for yourself or for someone you love. I’ll be happy to answer any questions you have about trauma and how it can be healed. I’d also like to ask you to consider buying an additional copy—or copies—to give to people you know who are struggling with difficult circumstances or have been exposed to trauma. I want to get my book into the hands of anyone and everyone who needs to hear a message of hope in hard times. My thanks to Michael Fanning, and to Sebastopol Copperfield’s for hosting this event and for being an all-around great bookstore! On February 26, 2012, trauma and tragedy entered the lives of Trayvon Martin and George Zimmerman. It entered the lives of the Martin and Zimmerman families. And on June 24, 2013, trauma and tragedy entered the lives of six anonymous women called to civic duty in Sanford, Florida. For 14 days, they listened to and watched the unfolding testimony of violence. For three weeks, they spent their evenings isolated in a motel room. At the end, to the best of their abilities, they formed an opinion, reached an agreement, and rendered a verdict. In the case of the State of Florida vs. George Zimmerman: Not Guilty. It’s abundantly clear that Trayvon Martin and his family, and George Zimmerman and his family have suffered severely—and in Trayvon’s case, suffered the ultimate loss of life. In the aftermath of the verdict, we might tend to overlook the painful experiences of the jury. Since the verdict, the media and the nation have been obsessively second-guessing the jury’s decision and questioning their character and integrity. This onslaught of criticism and blame adds to the burden they now carry from their exposure to emotionally disturbing images and evidence. I’m not going to weigh in on George Zimmerman’s innocence or guilt. I believe Mr. Martin and Mr. Zimmerman were both victims of their encounter. But I do know the women jurors committed no crime and yet are being tried in the court of public opinion. Another thing I know—they are suffering from secondary trauma. 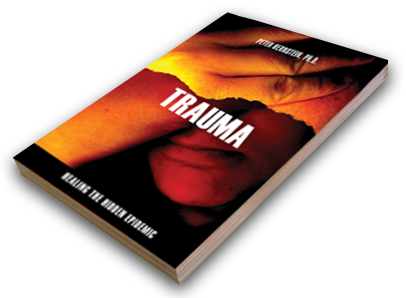 I define secondary, or vicarious trauma in my recently published book, Trauma: Healing the Hidden Epidemic. 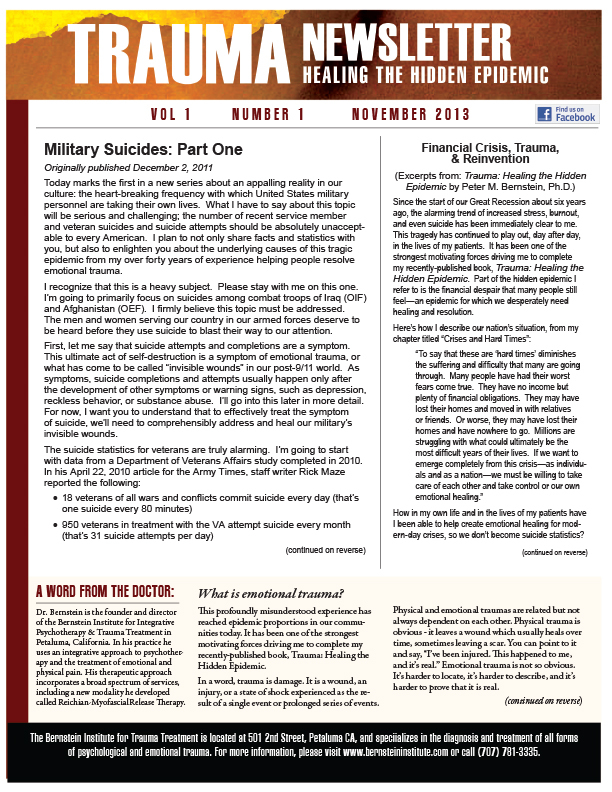 “Secondary trauma,” I explain, is “stress resulting from helping or wanting to help a traumatized or suffering person”. It can also result from witnessing disturbing or horrific events happening to others. Anyone who is exposed to suffering is at risk for secondary trauma. As a psychotherapist who helps people heal emotionally painful issues, I am intimately aware of the professional dangers of vicarious trauma. Left unaddressed, it can lead to depression, burnout, and the urge to self-medicate with alcohol or drugs. What do I do to prevent my secondary trauma exposure from taking hold and causing personal deterioration? I cover that topic in my book also. There are deliberate, constructive activities and attitudes that can make recovery possible. Know that part of you goes on “pause” when you witness a disturbing event. You may not be able to fully feel and react to what you’re experiencing at the time. However, you must go back, after the experience, and work through your feelings and reactions. Don’t bury them. A caring network of friends and family can be of great support and comfort. Use them. Take extra care of yourself both physically and emotionally. As much as possible, slow down, rest, eat well, exercise, put off major decisions, keep your life simple, and stay with what’s easy and familiar. Give yourself permission to feel or see things differently because of your experience. You are not the same person you were before. Don’t sink into embarrassment or shame; don’t judge or criticize yourself. Absolutely do not isolate yourself. Isolation will start you on a fast downward spiral. Share what has happened to you with supportive loved ones. Deliberately cultivate positive experiences, such as creative pursuits, dinner out, or watching a favorite movie, as part of your recovery. Don’t just anxiously “keep busy”. If necessary—if you feel stuck or haunted by what you’ve been through—seek professional help, either short or long term. The bottom-line truth in the case of Florida vs. Zimmerman is that no one came out a winner. Everyone involved, everyone who has been touched by the events in Sanford, has suffered to some degree. If you have experienced trauma, and I believe everyone does at some time, then I urge you to follow my suggestions above. Buried trauma never goes away. It’s never too late to heal. That’s one of the central messages of my book, Trauma: Healing the Hidden Epidemic.